The life span of Imam Muhammad Taqi Al-Jawwad, peace be on him, was shorter than that of his predecessors as well as his successors. He became imam when he was eight years old and was poisoned at the age of 25. 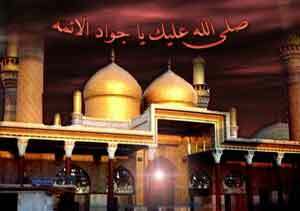 Imam Al-Jawwad, peace be on him, the ninth infallible Imam, was born on 10th Rajab 195 A.H. in the holy city of Medina. His agnomen was Abu’ Jafar and his famous titles were At-Taqi and Al-Jawwad. Since the fifth Imam Muhammad Al-Baqir, peace be on him, was called Abu’ Jafar, historians have mentioned this Imam as Abu’ Jafar the Second. Imam Musa Kadhim, peace be on him, had told one of his companions that his daughter-in-law (Sabikah) would be one of the most pious of women and to give her his salaams. She came from the same tribe as the wife of Prophet, peace be on him and his progeny, Maria Kubtiya who bore the Prophet his son Ibrahim (who died in infancy).